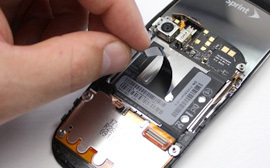 At Computek we repair all makes of Mobile phones from basic through to complex smart phones. On arrival all phones are assessed as to the viability of repair. sadly some phones will be beyond repair or the viability/cost effectiveness of the repair will far outweigh the value of the phone. We won't mess you about and tell you then and there your options. Fixed Pricing PolicyAt Computek we have a policy of fixed pricing for all repairs. We believe by doing this it makes us far more competitive and cost effective than any of out competitors. This can make us as much as 30/40% lower cost than our competitor/s for the same service and with our same high quality guarantee. Our effective lower cost is achieved by you paying for the part and we then charge you a simple 'Fitting Fee'. Whereas our competitors add profit to the cost of the part/s and also the fitting fee making them far more expensive for the same job with parts usually sourced via the same suppliers! 1Computek repair all major smart phones, iPhone 4/4s, iPhone 5/5c/5s, iPhone 6/6plus/6s, Sony Xperia 1/2/3, all model Samsungs; S3,S4, S5, S6 etc, LG, Huawei, Alcatel, HTC and many more..
2At Computek we do not require you to sign 'Disclaimers' to work on your equipment. There is no need as data is safe when only changing a phone screen.